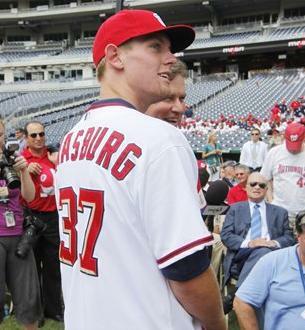 Freshman phenom/greatest pitcher ever, Stephen Strasburg, returns to Washington DC tonight. I'm not sure there was a parade but I'm pretty sure he gets helicoptered in to the stadium from now on. This is going to be his second home start in what I've dubbed "The Summer of Strasburg." So far, much more productive than "The Summer of George." His first start at home was nothing short of amazing as he struck out 14 over 7 innings while not giving up a walk. His second start was at Cleveland and it was a little rough. He gave up 2 earned, struck out 8 but walked 5 in only 5.1 innings. Tonight K-Stras™ takes on a streaking White Sox team. The White Sox have won 8 of their last 10 and are 7-2 against the NL this season. But you know what shocked me? The White Sox have struck out the fewest times in the league. 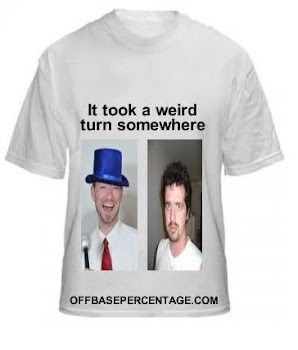 They've only struck out 322 times this year or 303 fewer times than the D-Backs. The rest of their team stats are fairly embarrassing but still. Maybe Strasburg can help bringing them closer to league average in K's tonight. Every Strasburg start is a must see event. So grab an adult beverage and a vuvuzela and join me over at Twitter at 6:05 pm or 7:05 for all of you east coast elitists. Jerks. But please follow me on Twitter @MnkysThrwngDrts!